I made a PDF of the latest draft of my thesis. I dropped it into Citavi. I would like in Citavi to reverse outline the PDF of my draft. This will help me to analyze and improve the coherence and organization of my paper. It would help if I could preview my PDF while I'm in the Knowledge view/tab--that way I could work on my category-comprised outline with the PDF in view. 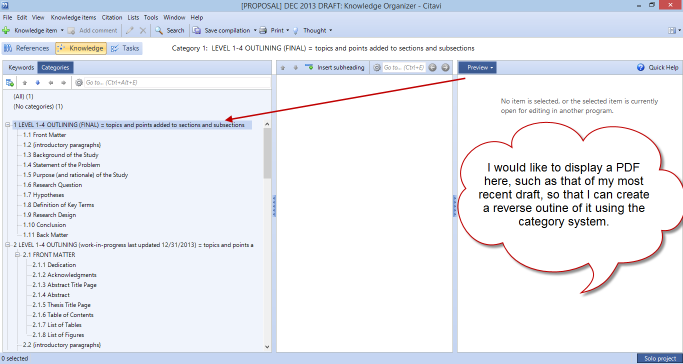 Is there a way to view a PDF in the Knowledge view's preview column? If not, is there a work-around for this reverse outlining strategy of mine, in the meanwhile? And if the capability doesn't exist, would you consider adding it? Thanks! I am ENJOYING Citavi immensely. Unfortunately, there's no way to view the PDF in the Knowledge Organizer other than adding it as an Image or file quotation. This won't give you a very good view of the PDF in the preview, though, as the PDF appears in a small box, so I would recommend opening the PDF in your PDF reader or adding the PDF as a reference or as an attachment to a reference, opening a second window for your Citavi project, and using the preview in the Reference Editor. To open a second window, on the Window menu click New window for this project. Thanks again for all of your helpful suggestions! We really appreciate you sharing them with us!